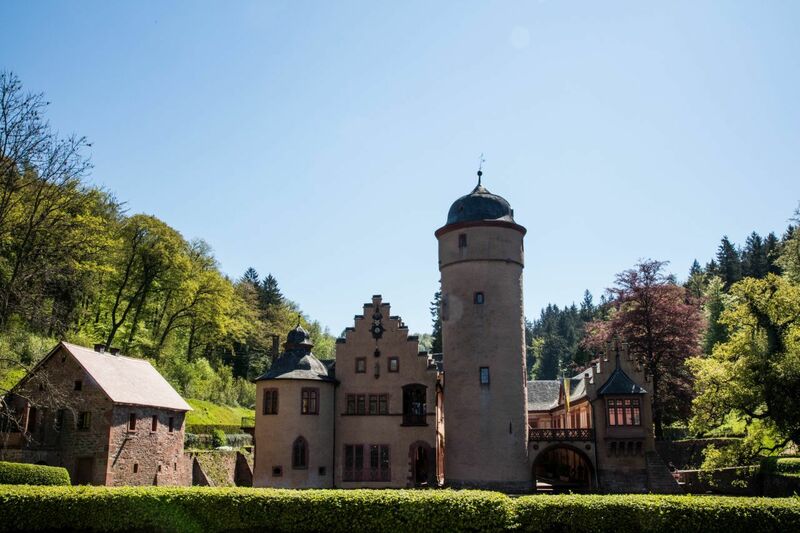 Only a few kilometers off of the A3 between Frankfurt and Würzburg, sits Mespelbrunn castle. 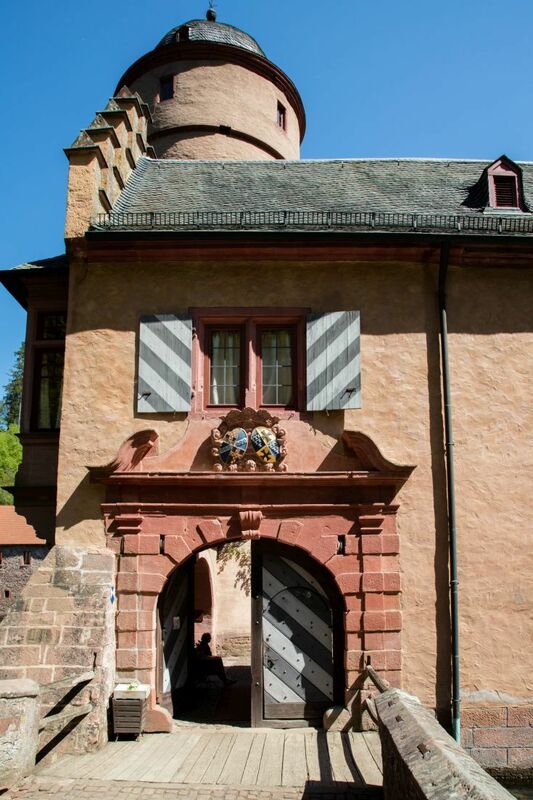 This castle is still privately owned, but open to the public for tours, weddings, or renting out a room in the tower. It’s small and cozy, but very peaceful and beautiful. We pulled into the parking lot early enough that there were only a few cars there already. We knew it would get crowded, though, because it was a gorgeous spring day in Germany and a Saturday to boot. We walked up the short hill and down the dirt driveway to the tiniest ticket booth. One lady and her dog sold us our tickets and told us the time of the next tour, ten minutes hence. 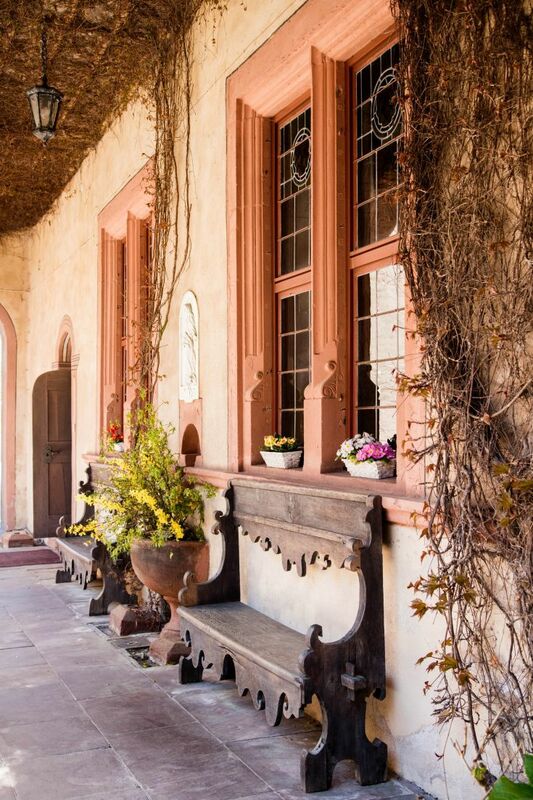 Like most castles, even ones that don’t still have the owners living there, the only way to see the inside is by guided tour. There was not an English option the day we were there, but we wanted to see the inside, so we just followed the tour around. The first room was next to the chapel and both were closed due to renovations, but the tour guide did point out the family tree in stained glass on the windows. 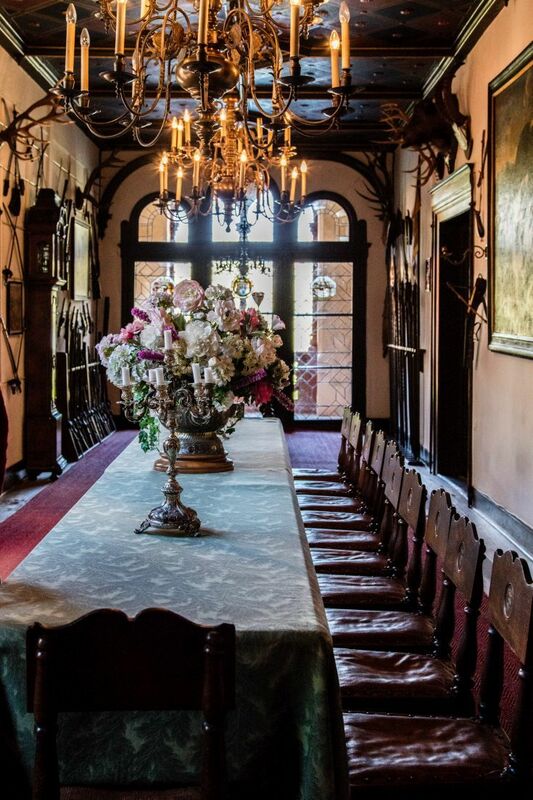 The last male heir has died, but his daughter is still the owner of the castle. Next we went upstairs to view the Knight’s Hall, a small sitting room, and a bedroom. It was all very museum-like with portraits of the family going back generations, as well as artifacts that the family has accumulated through the centuries. 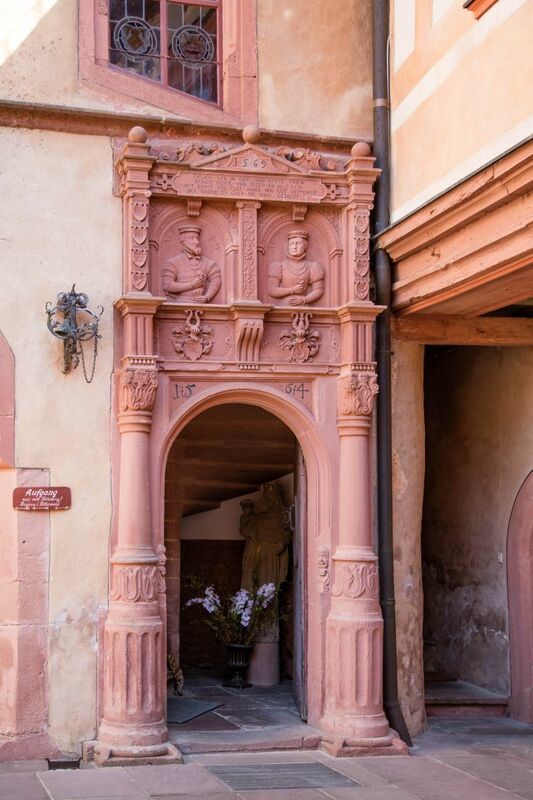 Mespelbrunn was awarded to the knight Hamann Echter for his service to the Archbishop of Mainz in 1412, and has been handed down from generation to generation for over 600 years. In the meantime, many distinguished guests visited Mespelbrunn. Two that I remember were writers, Johann Wolfgang Goethe and the Brothers Grimm. Apparently while the Grimms were guests of the castle, they were inspired to write the the fairy tale of Rapunzel. 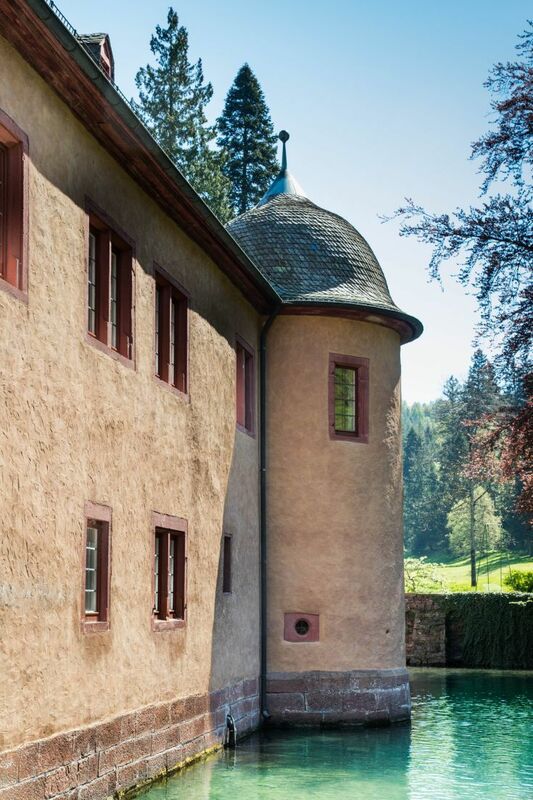 The tower is a stand-out feature of this whimsical castle, with cast iron steps that wind up to a tiny door. 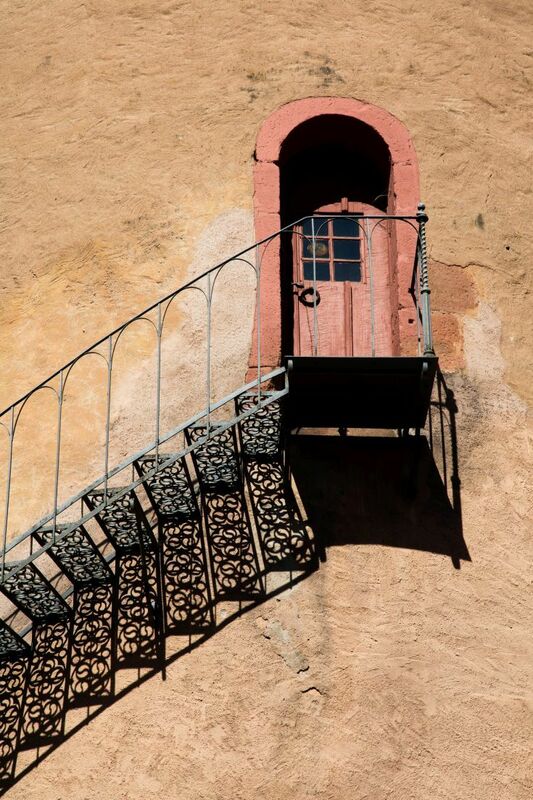 You can see why it would be easy to imagine Rapunzel being help captive there, and if you would like to see if you would be inspired, you can also stay at the castle. In fact, the guest room is in the tower. 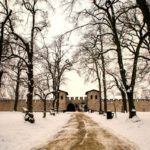 We enjoyed walking around the castle, photographing it from all sides as well as the few rooms we were able to see inside. At the very last, we walked down a path to the chapel on the hill, which even closed provided such a pretty picture. Luckily there are a few restaurants near the castle and we had a wonderful lunch before getting back in the car and heading home. 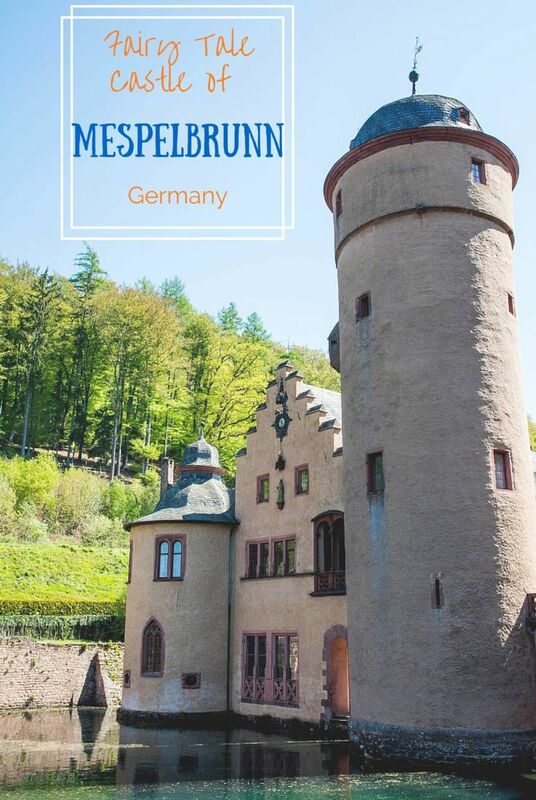 Mespelbrunn doesn’t take much time to see and it is such a great little stop along the autobahn in between some of the larger attractions and world heritage sites like the Residenz inWürzburg. 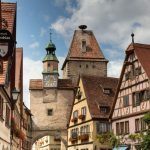 Driving is really your only option for getting to most of the smaller sites in Germany, and Mespelbrunn is no exception. 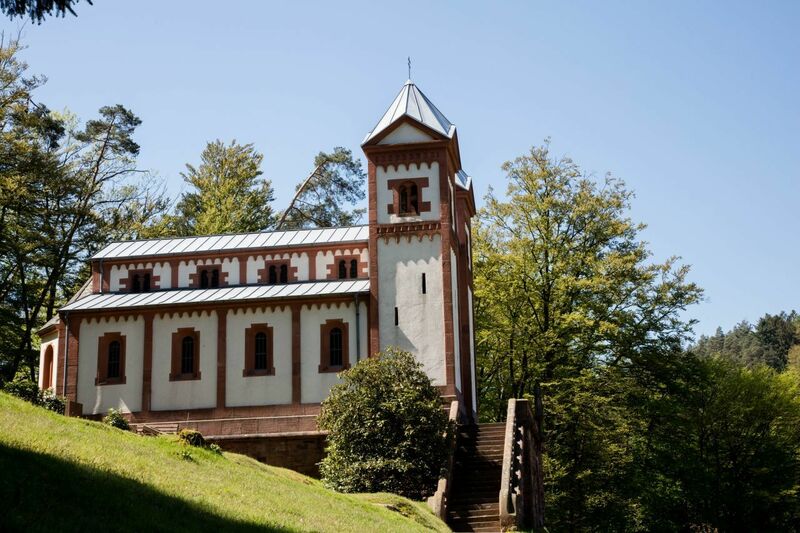 Take the 63 Weibersbrunn exit off the A3 and follow signs to Hessenthal. From there just follow the signs to the Schloss. Check the website for current opening times. When we visited the tickets were 5 euro for adults and 2 euro for children and students. I just read this aloud to my son and showed him the pictures and now he wants to go here, and I can’t blame him. This is one of the coolest castles I’ve seen. Thanks for sharing the awesome! I grew up not far from there, but unfortunately, I never made it there. It was always on my wish list for day trips, when I was a kid, but something always came up. Next time, I visit home, I need to make it a point to go there! Maria, It doesn’t take long, but it is beautiful. I would recommend you do go! How cute and quirky! I can definitely see Rapunzel there. Anabel, It is really quirky and cute. It was a nice little outing. you got all that information from a non-English speaking tour guide?! Wow! 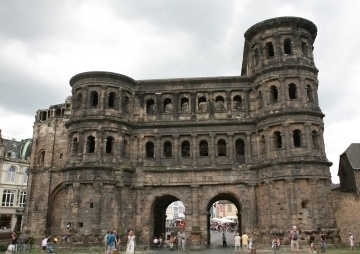 i really liked Germany (so orderly!) but had communication difficulties in the smaller towns – it seems some of them (especially the older ones) speak little English. Great people though! Michelle, It’s too bad you missed it. It’s very cute. Well thanks Rob! You might not have a fairy tale, but I’m sure you have lots of stories! Love this castle. Funny it looks so girly girl but it has been passed from male heir to male heir for so many years. Ruth, Maybe that’s what the Brothers Grimm thought as well. Love the castle tour! 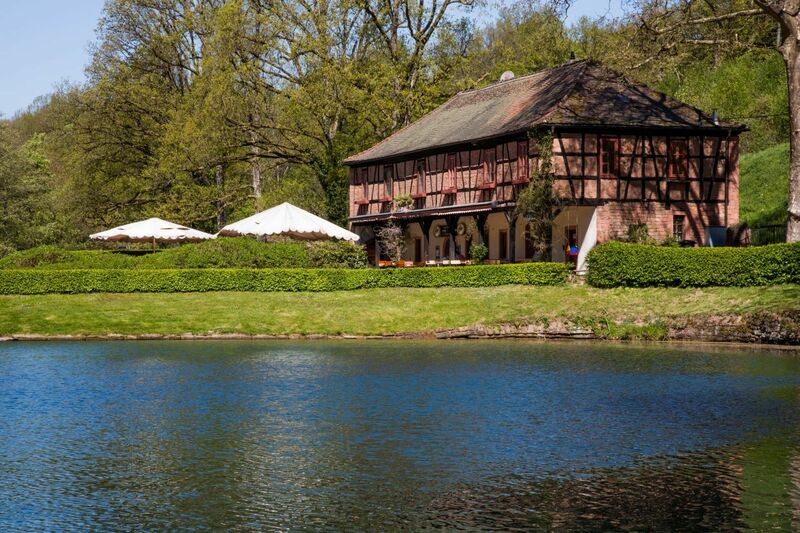 This is one we missed–I am actually visiting Germany right now, but it will have to wait for next time. We so miss living in Germany. Brooke, It’s so hard to leave a place already knowing that you have so much more to do when you come back, but at least it gives you something to really look forward to. How AWESOME! 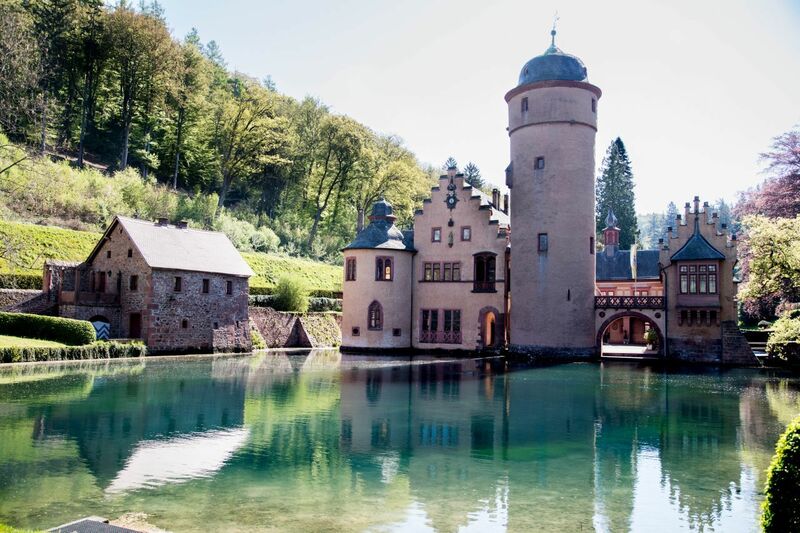 Our stomping grounds in Germany are not too far from this area, and we’ll be looking to do little daytrips when we are there in August/September. Katrina, This is an easy one day or even half day trip. It’s short but sweet. 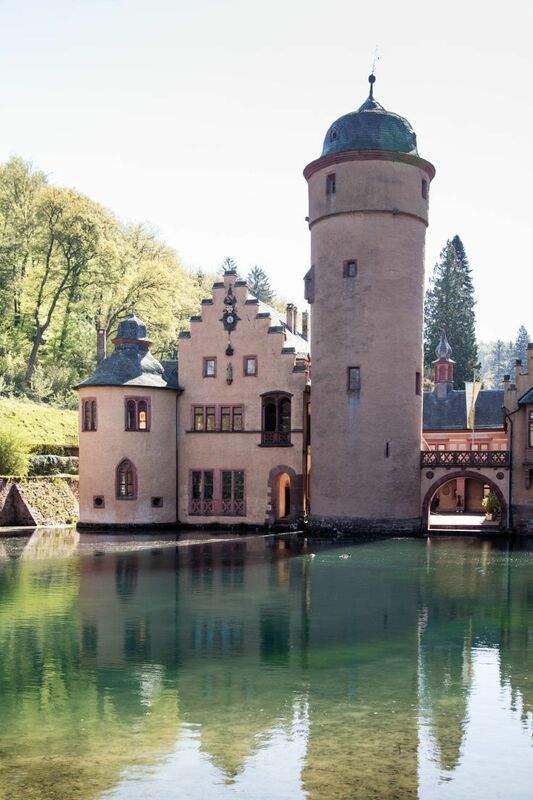 Very pretty place, I like how the castle opens up to the lake. Frank, It really is a gorgeous country. The castle was really charming. Tami, You probably did. It’s right off a major thoroughfare. I hope you get back and go visit. Indeed like a fairytale!! Love it.